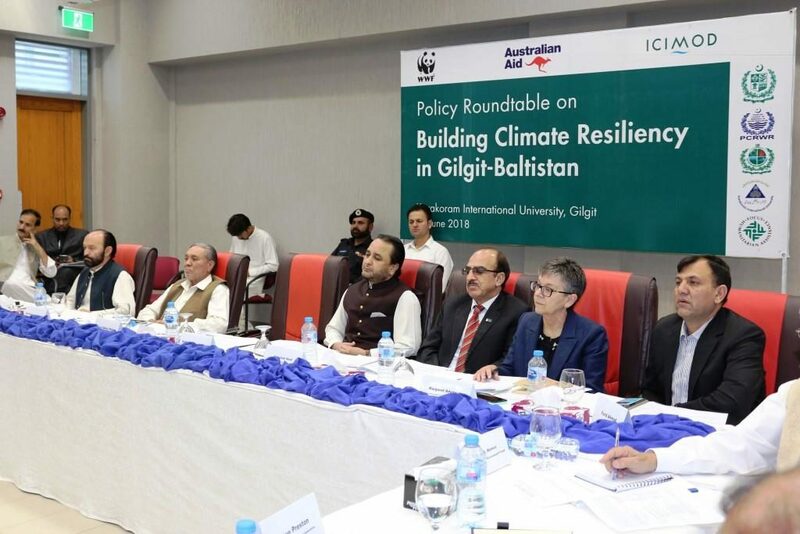 University hosted a high-level policy round-table on building climate resiliency in Gilgit-Baltistan. Pakistan Council of Research in Water Resources (PCRWR) and WWF-Pakistan organized the event with support of the International Centre for Integrated Mountain Development (ICIMOD) and active involvement of other partners like Gilgit Baltistan Disaster Management Authority (GB-DMA), Aga Khan Agency for Habitat (AKAH), Pakistan Agriculture Research Council’s Mountain Research Center (MARC) and Karakorum International University’s Integrated Mountain Areas Research Center (IMARC). 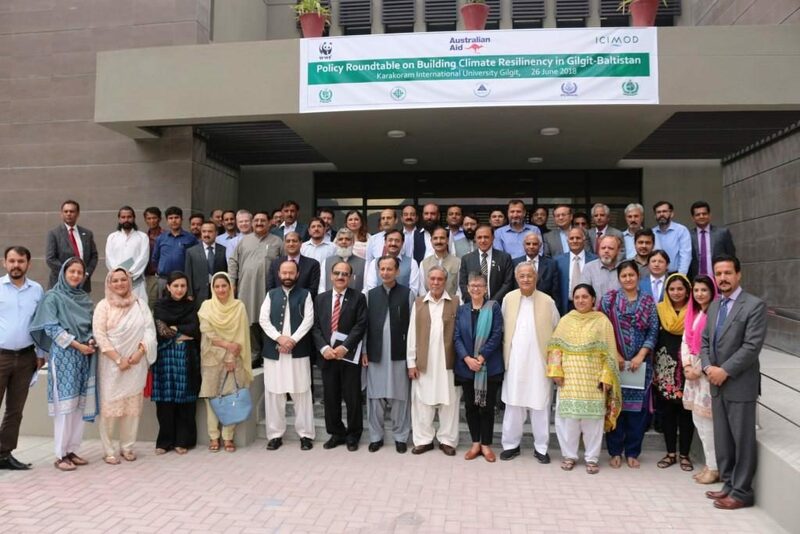 The event aimed to present the success and learning experiences of certain pilot interventions to the policymakers for potential up-scaling and out-scaling by exploring options of integrating the leanings into relevant policies in Gilgit Baltistan. The pilot interventions were carried out under a project, titled “Agricultural Water, Energy and Hazard Management in the Upper Indus Basin for Improved Livelihood. Implemented by ICIMOD, with the Australian Aid the project aims at demonstrating climate-smart water, energy, and hazard management technologies and enhance local capacities for improved livelihood and resilience to deal with the effects of climate change in the Upper Indus Basin (UIB). The Chief Minister Gilgit-Baltistan, Hafiz Hafeez ur Rehman attended the event as Chief Guest, while the participants included Speaker, Deputy Speaker and Minister Water and Power Government of Gilgit-Baltistan, the Vice Chancellor and faculty members of Karakoram International University, the Federal Secretary Ministry of Food Security and Research and Heads of relevant Federal and Provincial Departments, civil society organizations and representatives of local communities. In his inaugural speech the Vice-Chancellor, Prof. Dr. Atta Ullah Shah applauded the trust and confidence of all the partners in KIU to host such an august forum on one of the significant and emerging issues of our era – climate change. Prof. Shah underlined the vulnerabilities of Pakistan and Gilgit-Baltistan to the climate change effects. He also highlighted the impacts of climate change in the region, which are manifested in the form of natural disasters causing loss of precious lives and livelihoods. “KIU gives high priority to climate science and endeavors to promote research and academic programs in this regard”, remarked by the Vice Chancellor. While highlighting the KIU’s efforts on climate science he mentioned about the International Conferences and training workshops organized by KIU. 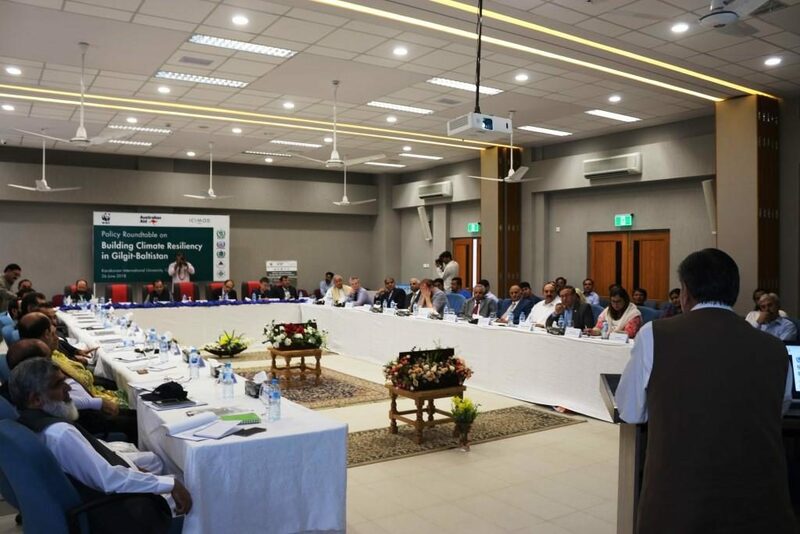 He informed the participants that very soon KIU will establish a climate change and glaciology centers in KIU with the support of the Higher Education Commission of Pakistan. “Collaboration is also planned with the Chinese Academy of Sciences”, he informed. Prominent scientists, policymakers and development professional shared their experiences and suggestions for collaborative efforts to deal with climate change effects. Some key speakers included Fida Muhammad Nashad Speaker, Jaffar Ullah Khan Deputy Speaker and Dr. Muhammad Iqbal Minister Water and Power Government of Gilgit-Baltistan; Senator Nisar A. Memon; Mr. Fazal Abbas Maken Secretary, Ministry of Food Security and Research; Dr. Ghulam Rasool, Director General Pakistan Meteorological Department; Dr. Muhammad Ashraf Chairman PCRWR, Mr. Sajjad Hyder Secretary Agriculture and Livestock Gilgit-Baltistan, Mr. Rab Nawaz Director WWF Pakistan, Dr. Babar Khan Director WWF Pakistan, Mr. Wallayat Noor Chief Conservator Gilgit-Baltistan Forests and Wildlife Department; Mr. Farid Ahmad, Director General GB Disaster Management Authority, Mr. Aman Ullah Khan Assistant Country Director/Chief Environment, UNDP; Dr. Ehsan Ullah Mir, Head of ETI, Mr. Muzaffar Ud Din General Manager AKRSP, Ms. Ayesha Khan Country Director Hashoo Foundation and Dr. Abdul Wahid Jasra, Country Representative ICIMOD Pakistan. Speakers in the technical sessions on Agricultural Water, Energy and Hazard Management included Mr. Farid Ahmed from ICIMOD, Mr. Faizan ul Hassan from PCRWR. Dr. Muhammad Zafar Khan from KIU, Mr. Saeed Abbas from WWF, Mr. Sher Ahmad from MARC-PARC and Mr. Deedar Karim from AKAH. Senator Nisar A Memon while moderating a session on way forward summarized the key points to carry forward some pragmatic solutions of climate issues in the region. Ms. Margaret Adamson, Head of Mission, the Australian High Commission, Pakistan also attended the event and appreciated the partners’ meaningful efforts. She argued that KIU is rightly positioned in the region to come up with research-based solutions on climate change issues of Gilgit-Baltistan and adjacent mountainous landscapes. Ms. Adamson reiterated the role of sound science and integrative efforts to cope with the complex climate change issues in the region. She informed the audience about the Government of Australia’s priority areas in academic and research fields. 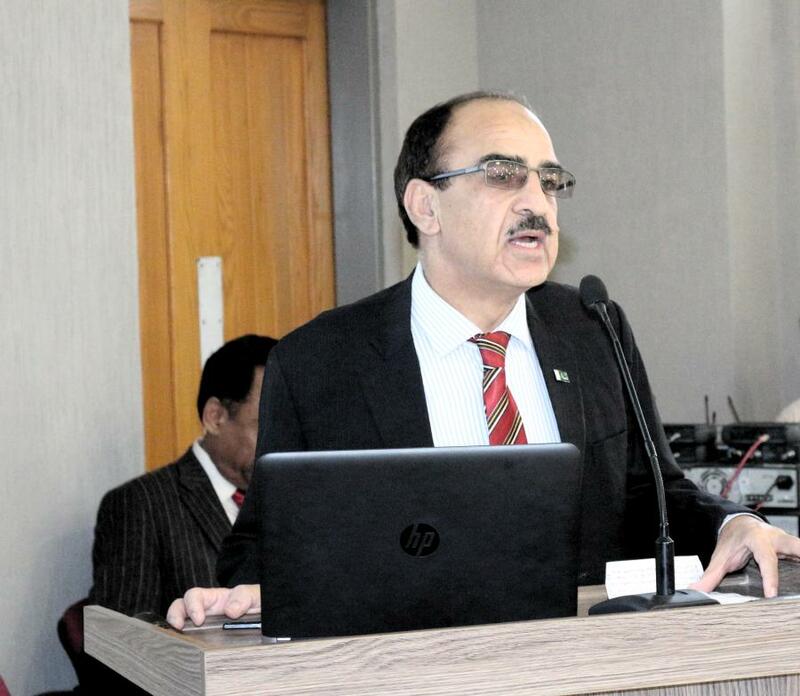 In his concluding remarks the Chief Minister Gilgit-Baltistan, Mr. Hafiz Hafeez ur Rehman highlighted the achievements of the Government of Gilgit-Baltistan in climate and environmental sectors. He informed the participants that the GB Government has approved its Climate Change Strategy and Action Plan developed in the light of the Climate Change Policy of the Government of Pakistan. He emphasized the environmental conservation in the face of mega developmental initiatives like CPEC and increasing tourism in the region and informed his government’s cautious plans in this regard, particularly by allocating a fraction of the budget under development schemes to deal with environmental protection and climate change adaptation. He reiterated the harmonious collaboration among academia, implementing agencies, government and civil society organizations to deal with the challenges of climate change. Prof. Dr. Khalil Ahmad, Dean Life Sciences, KIU. Dr. M. Zafar Khan, Assistant Professor of Environmental Sciences, KIU.